06.19.2008 - Raccoons are very urbanized animals. Studies reveal that raccoon population densities are about ten times as high in urban areas than in wild areas. Cities and suburbs simply have more of the resources needed for raccoons to survive - shelter in our attics and under our buildings, and food from pet dishes, handouts, and of course dumpsters and trash cans. 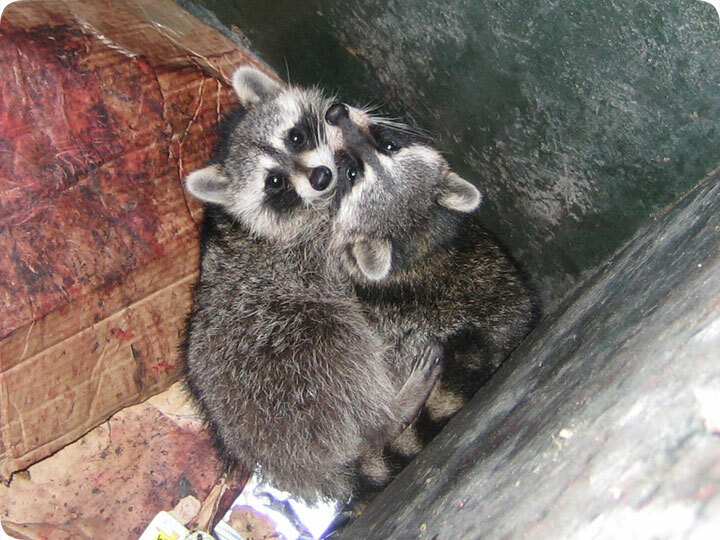 I frequently get calls about raccoons that are causing problems around dumpsters and garbage cans. Raccoons are very strong and crafty, and they make a big mess. They love to tip over garbage cans to find food. A homeowner wakes up and finds a mess of garbage strewn across the yard. Thus, I get called to come out and trap the offending raccoons who are creating the mess of garbage. Oftentimes, the removal of just one or two "trouble raccoons" who have begun to engage in a destructive behavior will eliminate the problem. However, when it comes to trash, there's a few things that the average homeowner can do to prevent the problem. First of all, don't waste food and don't throw out food. Second, don't leave the garbage outside for a long period of time. If possible, keep it in a garage or shed until garbage pickup. Also, sturdy cans help, especially with a locking lid. You can drill a few holes in the lid and sides of the can and affix the lid shut with bungee cords. In the above photo, I was called out for two small-sized raccoons that were stuck inside a dumpster. It was easy to climb in, but not easy to climb out. I used my snare pole and grabbed them out of the dumpster and relocated them about 15 miles away. Raccoon animal control in the city - Most cities have a good number of raccoons, and that might surprise you. The raccoons that live in a city setting like that of a city are adapted to living in very close proximity to humans. Many of these animals are no longer nocturnal, adjusting their eating habits to times when garbage is set out for the landfill. Because of the limited number of trees to provide shelter, it’s not uncommon to have a raccoon invade a home. In most other situations, the raccoon in a home would probably be a female looking for a good place to have her babies. In an urban area, a male raccoon can be just as likely to enter a building for protection. If the raccoon is without babies, trapping involves securing a cage trap to the door to the raccoon den and scaring the animal out, into the device. Critters with infants can be lured into cage traps if you sneak the babies out and use them as bait in the trap. Once the mother enters the device looking for her young, you will then be able to relocate them all at the same time. Trapping the mother first and finding the babies later brings about the potential for the mother to abandon her litter.